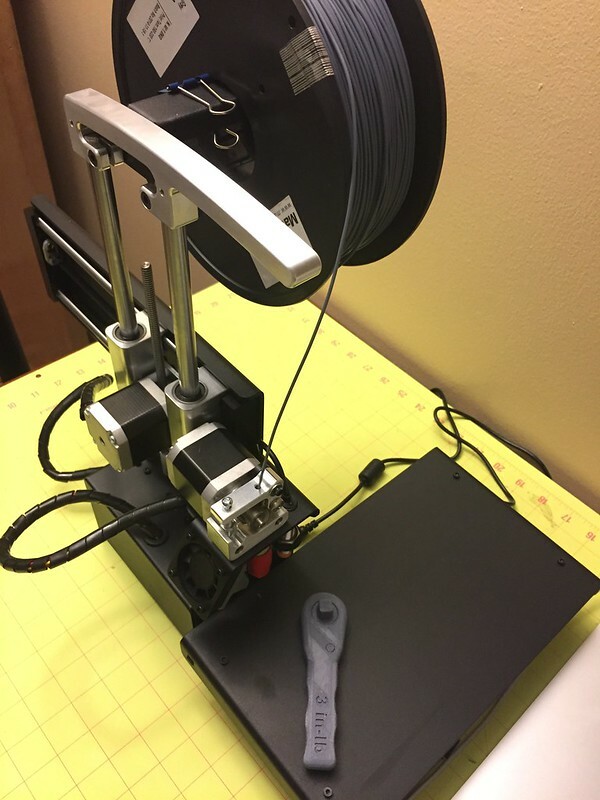 I have been meaning to post this news for a few days… I finally have my first 3D printer (a Printrbot Simple Metal). Check it out! And, yes, one of the first things I printed was the wrench NASA emailed to the ISS (http://nasa3d.arc.nasa.gov/detail/wrench-mis). It is supposed to have a ratcheting action, but some of the moving parts fused together on my run. Guessing I need to calibrate the printer some more before the wrench will turn out correctly (but it is still cool). Speaking of calibrating a 3D printer, Matt M. has some experience in that area so I asked him for some advice. Here is what he told me (the comments about pressure vessels relate to our hardware project for 2015 – a classroom scale (hopefully 3D printed) cold gas thruster – more news on that as it becomes available). I laid out the framework for a definitive guide to calibrating FFF 3D printers https://opendesignengine.net/projects/vg3dp because I couldn’t find anything that anybody else had written that both made sense and covered the entire process. Containing pressure is going to be an interesting stress test for FFF 3D printed parts. The layers pretty much guarantee delamination prior to actual material failure. Now that you’re going to be experimenting with it my suggestion is to try something that I never got around to. Since the problem is that the layers aren’t bonded to each other as well as to themselves I used to wonder if the plastic could be “stitched” together by having the nozzle move up and down as it extrudes. That way one layer will have bits that dip down and spread out in/under lower layers so that they’re hooked together. You can also do post-processing like using acetone (for ABS) to weld the outer surfaces together, or wrapping the printed part, or just using the printed part as a negative for a mold. Oh, hey, another thing to think about is that if you’re going to make parts where the most important dimensions are round you could use a printer that has a rotating bed instead of all the motion being perpendicular. Thanks Matt for all the great links. I will be catching up on all of these ASAP. Thanks Aaron for the assist with the writing! For those with edit access, please fill in any topics that you think we need to discuss, everyone else post a comment with topic ideas below.